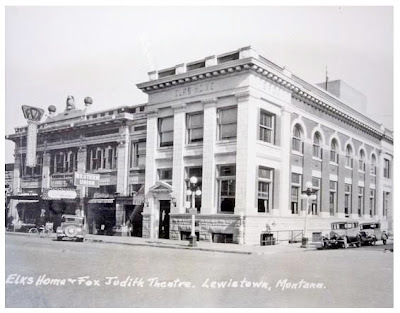 Since I mentioned the Judith Theatre in Lewistown yesterday, I thought I'd follow up with an historic photo of the place. The Judith was built way back in 1914, but this shot is probably from the 30s or so. You can see the large sign out in front noting that the building was part of the Fox chain. The building next door to the Judith was the Lewistown Elks Home. I love the Judith Theatre! I haven't been to a movie there yet though. I'm so impressed with all of the great adaptive-reuse in Lewistown, including the High School building into condos. Thanks for sharing! Thanks, Courtney! I love the Judith, too, along with much of downtown Lewistown ... though I don't think I could live there. It's a great place, almost completely free from the big-box chain store phenomenon. What more could you ask?